Rafael Novoa started the season at single-A Clinton. By July 31, he'd made it all the way to San Francisco. It was the strikeouts that got him there, The Associated Press wrote. In 140 innings on the year between Clinton and AA Shreveport, Novoa struck out 154 batters, The AP wrote. In his debut, 5.2 innings against Houston, Novoa gave up a single run, striking out four and walking three. "That's the same fastball I saw in Phoenix (during spring training)," Craig told The AP afterward. "He had trouble with the walks, and that hurt him today. And he'll have to work on his move to first base." Novoa made the majors quickly, just over a year after he was drafted. But his stay would be brief. He appeared in seven games that year and 15 more three years later, marking the extent of his big league career. Novoa's career began in 1989, drafted by the Giants in the ninth round of the draft, out of Villanova. At Villanova, Novoa was 10-3 by late May. His third loss came against No. 3 Miami, giving up three runs in seven innings, striking out five. All three runs came in the fourth inning. "I made some bad pitches in that inning," Novoa told The Gainesville Sun afterward. "The No. 3 team in the country will hit bad pitches." With the Giants, Novoa started at short-season Everett, moving to single-A Clinton. He went 5-5 with a 2.97 ERA between the two. He also struck out 81. In 1990, Novoa started at Clinton, going 9-2 with a 2.40 ERA and 113 strikeouts. His stop at AA Shreveport lasted 11 games with Novoa going 5-4 with an ERA of 2.64. Called up in late July, Novoa had that good first start. Then came his second. On Aug. 5, Novoa went just 3.2 innings, giving up seven earned runs. Three of those runs came off an Eddie Murray home run. Novoa returned to the Giants in late September, as a reliever. Sept. 30, he got a four-inning save. He finished the season 0-1 with an ERA of 6.75. Novoa didn't return to the majors until 1993. In the meantime, he played 1991 at AAA Phoenix, his final year with the Giants. He went going 6-6 and was released the next spring. Signing with the Brewers, Novoa spent 1992 back at AA, at El Paso. He went 10-7 with 124 strikeouts. The next year, Novoa returned to the majors, after a trip to AAA New Orleans. Novoa hit Milwaukee in July, appearing in 15 games, starting seven. In his third start, Aug. 5, Novoa pitched a complete game, giving up two earned runs and walking one. He also got the loss. "I just wanted to make them put the ball in play," Novoa told The AP afterward. Novoa finished the season 0-3 with a 4.50 ERA, ending his major league career without a win. 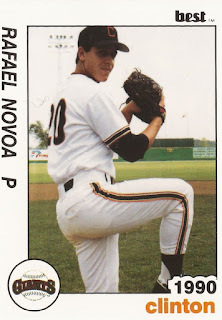 Novoa played four more seasons in the minors, going through the Cubs, White Sox, Mets and Angels systems. He finished out his career in 1997 playing independent ball with the Chico Heat of the Western League.